Hours: The Royal Gardens Kew is open year round starting at 9:30am until sunset. Visitors will enjoy exploring two and a half centuries of history at one of the most famous world gardens. The Gardens are a paid admission exhibit. Palm House: The Palm House at the Royal Gardens Kew is considered by most experts to be one of the most significant Victorian glass and iron structures still surviving anywhere in the world. When it was originally designed, the project was the first of its kind, using techniques that were already in use in shipbuilding. Xstrata Treetop Walkway: Timber from various types of trees form a pathway that leads belowground and takes visitors into the Rhizotron. Below ground guests will learn the unique relationship tree roots have with the soil they grow in, as well as the impact various organisms have on the life of the tree. Above ground guests can take a stroll along a two hundred meter long walkway that leads through the crowns of those same trees. Temperate House: This sixty three foot high glasshouse covers almost six thousand square feet and is the largest Victorian greenhouse found anywhere in the world. This particular glasshouse has become the final planting spot for many of the plants in the Gardens that can no longer grow elsewhere. The Royal Botanic Gardens Kew keeps an impressive collection of fruit and citrus trees in this house. Princess of Wales Conservatory: This sloping glass conservatory houses ten different climate zones where visitors can meander through regional plant displays from around the world. They will view Asian carnivorous plants, Central American climbing orchids, and bamboo trees from Madagascar, to name a few. The Conservatory was commissioned in 1982, designed as a replacement for two dozen other smaller structures that were in disrepair. The Royal Botanic Gardens Kew named this conservatory after Princess…Augusta, who was the founder of Kew. Princess Diana did however attend the opening ceremony and dedication in 1987. Aquatic Garden: The current aquatic garden was built in 1909 to replace the previous tank that joined the Gardens in 1873. The original pool had built in heating, so the aquatic plants would have a head start to the growing season, however the current design allows the plants to grow at the normal regional temperatures. 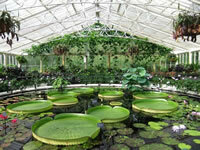 Over forty varieties of water plants can be found in this water garden. Arboretum Nursery: This behind the scenes nursery is a collection of fields and greenhouses where the Garden's woody type plants are grown and cared for. While the nursery is not on view to the general public, there is one viewing platform constructed near the holly hedges where guests to the Royal Botanic Gardens Kew can get a good view of the nursery, and the work that goes on there. The Arboretum takes up roughly 80 hectares of ground at the Gardens, which accounts for some two thirds of the overall grounds. 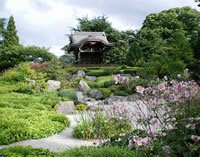 Azalea Garden: This garden was designed to showcase deciduous hybrid azaleas. There are over twenty nine planting beds in this azalea garden that form concentric circles that exhibit varieties dating back to the 1820’s. These exhibits can offer gardeners exciting examples of azaleas that are both beautiful and hardy, and can be used elegantly in small or large gardens. Late spring visitors to this garden will be rewarded with bountiful blooms and lush foliage. Badger Sett: A rather unique feature of the Royal Gardens Kew is the group of roughly twenty four badgers that have made the Gardens their home. It is believed the badgers migrated to the garden from a nearby park, and could not travel on due to the proximity to the city of London. Badgers are a protected species under law, so the garden staff do not bother them, or try to remove them, even when they burrow through the grounds and dig up plants. Bamboo Garden : Located in this authentic Japanese garden lies a traditional farmhouse that began its humble beginnings in Okazaki City, Japan. After their house was destroyed in a bombing raid in 1945, the Yonezu family bought the farmhouse and moved into it, where they continued to lived until 1993. After the last family member passed away, the house was donated and moved to the Royal Botanic Gardens Kew, where it has become a centerpiece for this garden. Bee Garden: The bees of the Kew Gardens once called the grounds behind the palace home, until they were moved to a more weather tolerant location in a wildflower garden near the main gate. The bees can and will fly as far as six miles in search of food, so that leaves plenty of ground and flowers within the gardens to forage from. Berberis Dell: Visitors to the Royal Botanic Gardens Kew are sure to be amazed by the impressive collection of mahonias and berberis found in this display. Most berberis are hardy to the climate of Britain and they are extremely tolerant of most soil conditions. The colorful blooms of orange and yellow begin in early spring and continue through the summer, while the blue, black, and red fruit can be found in autumn. Bonsai House: This house was originally constructed in 1887 and has been rebuilt and enlarged several times over the decades. At any given time guests to the bonsai house can view up to ten of the garden’s miniature trees that date back over one hundred and fifty years old. Among the collection you will find Japanese pines, cedars, and maples, along with Chinese junipers, larch, beech, and hawthorn. Several of the bonsai trees in this collection are considered to be the oldest bonsai still surviving in Britain today.